PVA is a soluble filament that dissolves quickly in hot water. This filament lets you create support structures that disappear once the part is printed (PLA printing on a dual head printer). Available in 1.75mm and 2.85mm, pro quality PVA is in stock. PVA (polyvinyl alcohol) is widely used in 3D printing to create support structures on cantilevered sections of prototypes. Printed together with PLA (same printing temperature), the print head holding the PVA will print the support structures, while the other print head prints the structure in PLA. The PLA/PVA pairing is therefore ideal for printing complex parts with lots of support structures. Want to know how to print PVA? Our advice is given in the product descriptions, including temperature, speed, and other tips for creating successful 3D prints and buying the right product for you. Buy PVA at the best price at Makershop3D. 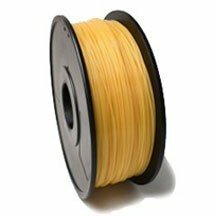 Atlas Support Natural filament from the FormFutura brand is a soluble filament made of PVA. It’s used as a support for double extrusion prints. This filament is fully biodegradable when dissolved in water. Comes in a 300g spool.